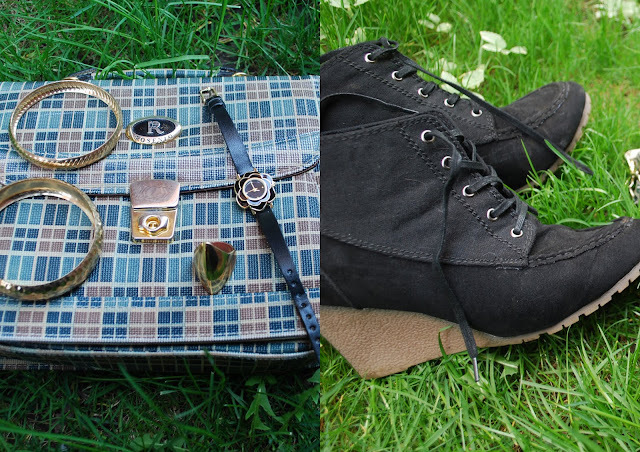 I have been coveting rust coloured items since the fall, and I have no idea why. I'm constantly on the look out for rusty oranges and dark mustardy yellows, but somehow or another items of clothing I find in this colour range never "work out" for me. I found this shirt on New Look UK and had to purchase it the SECOND I saw it- and it was on sale too! I've had so many hits with New Look, I seriously love them. Their shipping is uber fast (takes less than a week with standard) and their products are always at really great discounted prices. You should all honestly check them out! you are doing the damn thing!! I LOVE the look and the purse is uber cute!! CUTE! love the shoes and the top is a good color on you. I've been contemplating on those wedge booties from Evans for quite a bit. And now that I see how it looks, I'm going to get 'em. Anywho, cute look. Love the clutch bag! i've been looking for a shirt like this for the longest and i love the way you paired it with the leggings and boot wedges!!! keep doing the damn thing!! !